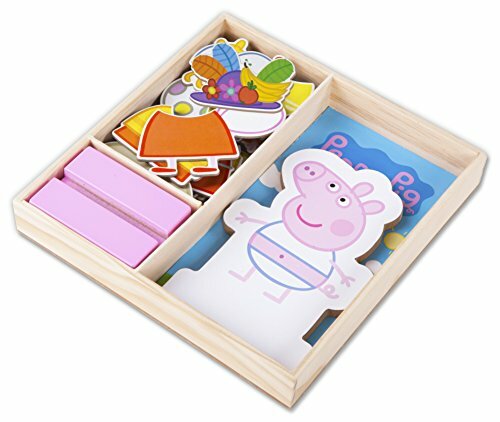 Peppa Pig Magnetic Wood Dress Up Puzzle (25 Piece) by Peppa Pig at GB Toys. MPN: 68012. Hurry! Limited time offer. Offer valid only while supplies last. It's a Peppa Pig fashion show! With a selection of tops and bottoms, create fun outfits for any occasion with this Magnetic Wooden Dress Up kit. It's a Peppa Pig fashion show! With a selection of tops and bottoms, create fun outfits for any occasion with this Magnetic Wooden Dress Up kit. Features chunky, easy to grip magnetic wood pieces, fun scenes and a wooden storage box for easy clean-up.